The manufacturer says that the black ink will last up to 25 years outdoors. .032" thick aluminum with 1/2" safety radius and 4- 3/16" holes. Screen printed with the best quality solvent based inks. NRECA Members receive a 10% discount off these prices. Please mention when placing your order. 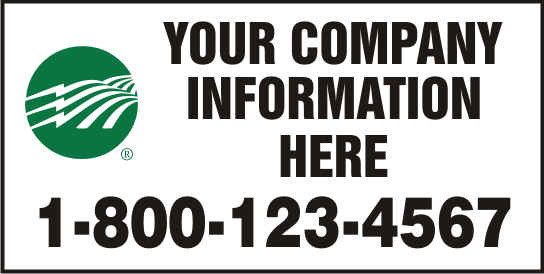 CUSTOM COMPANY SIGN WITH YOUR COOP NAME AND CONTACT INFORMATION. .080" thick aluminum with premium 3M Brand 7 year vinyl graphics. 3M Brand 7 year vinyl graphics. 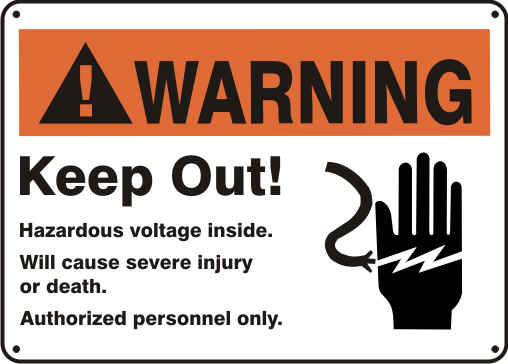 The American National Standards Institute (ANSI) states that safety signs should be in a position to alert viewers in sufficient time to take precaution against the hazard of the electrical supply substation. Safety signs can feature three elements: a signal word, a message and a pictorial. A signal word can be "Danger," "Warning" or "Caution". The message of the safety sign indicates the danger and gives a command to the viewer. For example, the message of a safety sign can say "Hazardous Voltage Above. Keep Off". A pictorial illustrates the danger. For example, a pictorial can show a stick figure of a person contacting the hazardous voltage and falling. The signal word should contain letters that are an adequate height for viewing. The ANSI states that the minimum height of the letters of a safety sign's signal word should be the viewing distance divided by 150. For example, if the viewing distance is 75 feet, then the letter height of the signal word should be 6 inches, since 75 feet divided by 150 yields a result of 0.5 foot. The font should be legible when read at an angle in addition to being read when the viewer is in front of the safety sign. The colors of the signal word should be an extreme contrast from the color of the background of the safety sign. 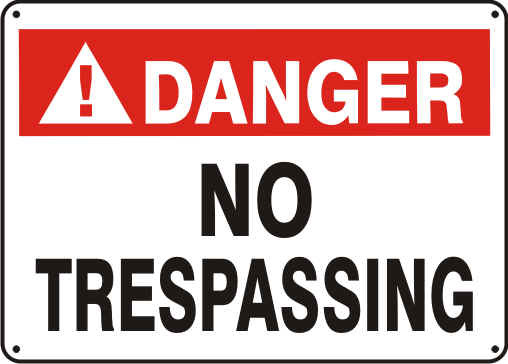 The word Danger should feature white letters on a red background. The term "High Voltage" should be in black letters on a white background. 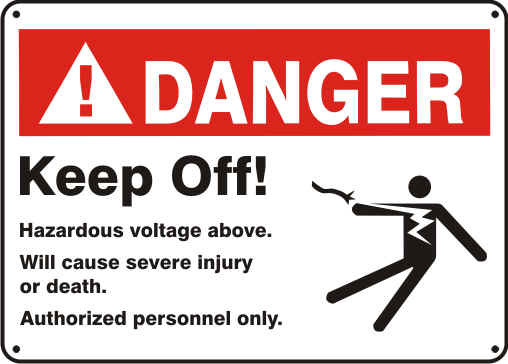 Signs on the enclosure of an electrical supply substation should be at least 14 inches long by 10 inches high with the words "Danger High Voltage Keep Out" in three horizontal lines of white letters against a background field of red and black. 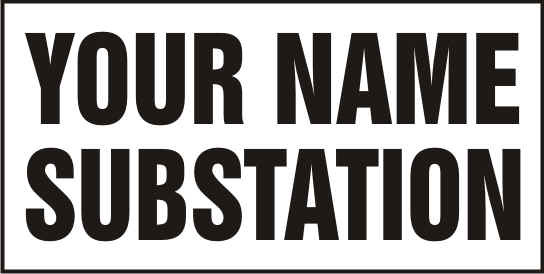 The NESC requires a No Admittance safety sign at each entrance of an electrical supply substation and at least one safety sign on each side of a substations enclosure. Depending on the size of the enclosure, signs that state "Danger High Voltage" should be no more than 40 feet apart. 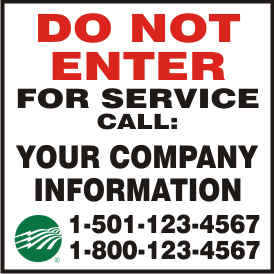 A safety sign of an electrical supply substation should have an orientation of 90 degrees to a viewer's line of sight. Adequate illumination should surround each safety sign. Signs that identify equipment within the electrical supply substation or that include operating instructions should be either on or near the equipment in a place that does not interfere with the operation of the equipment or that acts as a hazard.